Love it! Just got it last weekend so I haven't put it the the full range of abuse that I will eventually throw at it, but it is exactly what I wanted and performing splendidly so far. Dilly, dilly! 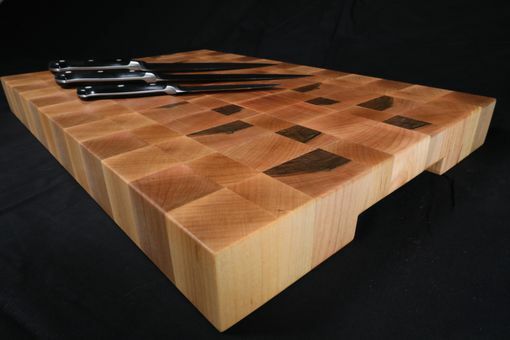 The biggest benefit of an End-Grain Cutting Board is that it keeps your knife blades sharper longer. When chopping on end-grain, the knife blade slices between the wood fibers much like cutting between the bristles on the end of a brush. Because the knife isn't meeting a blunt surface the knife edge stays sharper longer. The added benefit to cutting between the fibers is that you don't end up with knife marks all over your board. 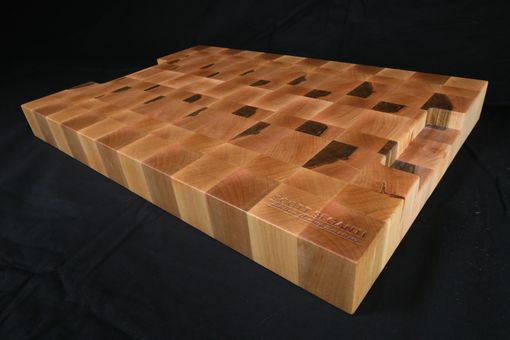 Every cutting board we sell comes pre-conditioned with food grade mineral oil, beeswax, and carnauba wax. The mineral oil provides a protective layer with antibacterial and antiseptic properties, while the water-resistance properties of wax help keep the moisture out. The glue we use is FDA approved and waterproof. When wood gets wet the wood fibers swell and can make the side of your board feel fuzzy or rough. 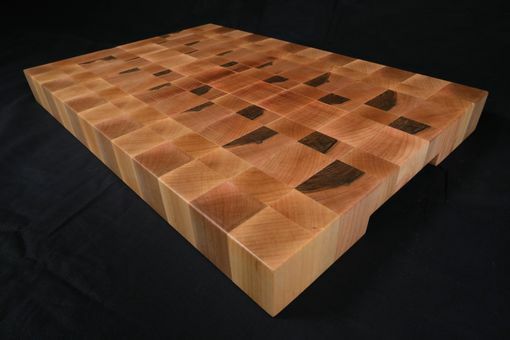 This effect is minimized by raising the grain with water and sanding it back; a process we do to all of our cutting boards. 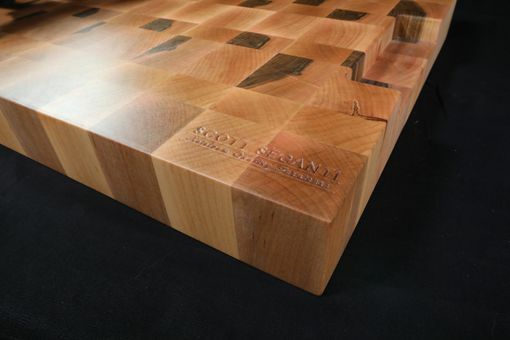 Our cutting boards come with cleaning, conditioning, and maintenance instructions. We also include a bottle of conditioner to get you started. 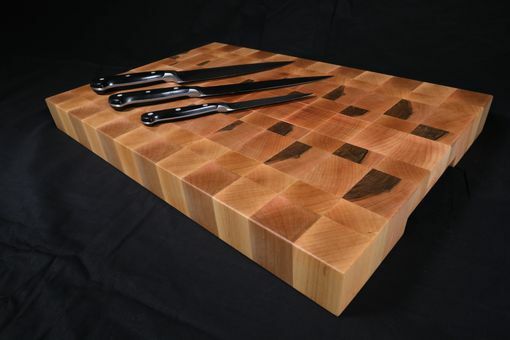 We can customize our cutting boards to any size or shape (rectangle, square, or circle). Contact us for a custom sizing quote. 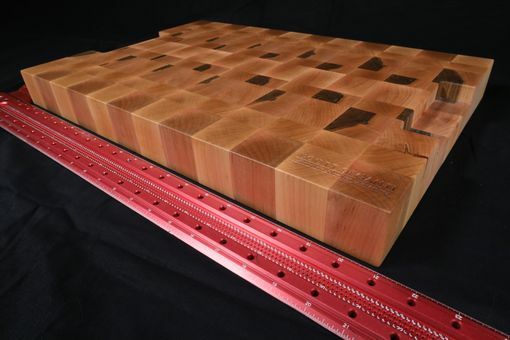 Our cutting boards are made of north American maple, walnut, or cherry. Other species can be used upon request; however, we may recommend against using exotic woods depending on species. Please contact us for a custom quote if you prefer a wood species that is not listed as an option. Every maker has a story. Be a part of Seganti Woodworking's story by placing an order, leaving a review, and seeing your review appear here.